PHILADELPHIA—Like many young Americans, Julia Capece went straight from high school to college. Halfway toward her bachelor’s degree, however, Capece decided to move out of her parents’ home. She tried juggling work and school but living on her own and keeping up with tuition and coursework proved too much. Capece finally gave up and dropped out, becoming one of 37 million Americans who have some college credits but no degree. That’s more than 20 percent of the working-age population. At a time when there’s more of a push than ever to increase the number of Americans with college degrees, close to half of the people who start college, like Capece, end up walking away, many of them saddled with debt. College dropouts who took out loans leave with a median debt of $7,000. Some give up only a few credits away from graduation. But it’s not just dropouts who are paying the price. Students who quit college are costing taxpayers around $3 billion a year in state appropriations to colleges and universities, as well as federal and state grants to students, according to Mark Schneider of the American Institutes for Research, who has studied the problem. And that’s only for beginning full-time students who drop out during their first year. If every dropout were counted, the cost would be much higher. “Taxpayers have a lot of skin in this game,” Schneider said. Now public-policy groups, private foundations and higher-education officials have a new idea for increasing the share of the population with college degrees: convincing people who quit college to come back. A program called the Center for Adult Learning in Louisiana, or CALL, for instance—sponsored by that state’s board of regents—offers courses that take less than half as long to complete as traditional college courses, and awards credit for what students already know through a process called “prior-learning assessment.” All of this is meant to help people with some college credits complete their degrees. One of CALL’s success stories is John McGee, who had spent seven years in the military and more than a decade as a manager at a Louisiana casino when he went back to college as a working adult. Despite his experience, McGee had to take the same introductory courses as an 18-year-old, leaving him bored and frustrated. Through CALL, McGee tested out of five introductory courses by passing a series of exams. He took the rest of his classes online in the accelerated format, and finished an associate degree in less than a year. “Learning became interesting, because I felt like, man, I’m finally accomplishing something,” he said. But formidable obstacles remain, including universities themselves, which are set up in a way that doesn’t do much to stop students from dropping out in the first place, never mind coming back to finish. “Colleges and universities are not doing their jobs,” Schneider said. That’s because, historically, there has been little incentive for colleges to focus on completion, said Sallie Glickman, co-founder of a Philadelphia program that helps dropouts return to school. Most public college and university budgets are based on how many students the institutions enroll, not how many they graduate. “All the money, all the resources, all the energy” have been focused on getting more people to go to college, said Glickman. For those who drop out, she said, there has been no organized effort to get them back. But Bryan Cook, director for policy analysis at the American Council on Education, which represents presidents and chancellors of U.S. colleges and universities, said getting dropouts to come back may not be worth the cost and effort. Going back was always the plan for Marilyn Johnson Jackson after she dropped out of college at age 19. But as it does for many people, life got in the way. 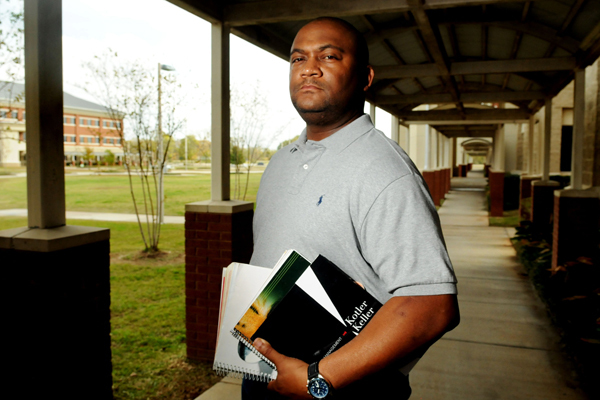 It took Johnson more than a decade to give college another shot. When she finally did return, Johnson took night classes at Louisiana Tech. But with a full-time job and a son in middle school, the schedule was a nightmare. Jackson ended up quitting college for a second time. Many students who return to college end up quitting yet again, said Stan Jones, a former Indiana commissioner of higher education who is now president of Complete College America, which is pushing for policy changes that will make it easier for dropouts to finish college. Jones said many returning students fail to stick with it because most colleges aren’t set up to meet their needs. In addition to rejecting transfer credit or refusing to give credit for professional experience, “The colleges that we have now were designed for traditional students that lived on campus, went full time, and had resources,” Jones said. Most of today’s college students don’t fit that profile. Three-quarters commute to class, 40 percent attend part time, a third are 25 or older, and most have jobs. At community colleges, where close to half of all college students are enrolled, more than 40 percent of students work full time. To get more dropouts to finish, and to prevent them from quitting in the first place, Jones said, colleges and universities need to make radical changes. Colleges are not “working hard enough to have [dropouts] come back to a different situation,” he said. Jones said that colleges need to schedule classes in ways that work for people with busy lives, provide better counseling to help students navigate choices about courses and degrees, and make it easier to transfer credits. They also need to offer more online and accelerated-degree programs, he said. And Jones said colleges should give students course credit for professional experience. But the main challenge is getting dropouts to consider going back to college in the first place, said Hadass Sheffer, executive director of Graduate! Philadelphia, a city-supported program that offers free counseling to adults who want to finish degrees. Graduate! Philadelphia operates a “comebackers center” in a downtown mall. Big photos of smiling college graduates hang from the ceiling. “Anyone who wants to go back to college can just walk in and they will be helped,” said Sheffer. Julia Capece heard about Graduate! Philadelphia at work. Now a clerk for the city, Capece had been trying to return to college for years, but was overwhelmed by the process. “I felt really defeated,” she said. A Graduate! Philadelphia counselor helped Capece enroll in a community college program that’s free for people who have at least 30 college credits but no degree. Her plan is to finish an associate degree first and then transfer for a bachelor’s. Counselors at Graduate! Philadelphia are available to help her through the entire process. Emily Hanford is a correspondent at American RadioWorks, the documentary series from American Public Media.